The Shanghai was holding-in initially and even spent much of the day trading unchanged until late afternoon. Talk that President Trump could be planning additional Trade tariffs coupled with speculation of curbing Chinese tech investment wobbled markets. 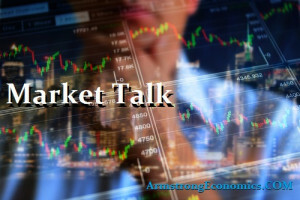 These rumblings hit all of Asian indices and also DOW futures as the uncertainty over the global trading position continues to unfold. In Japan the Nikkei drifted also as nerves spread throughout the region. As the currency was bid up, so the Nikkei began to sink. By the close the loss was not that severe (-0.8%), but it was the lows of the day and just ahead of month end. The Yen traded much of its day mid 109’s, though it is starting to weaken late in the US trading day. The SENSEX trended weaker with the crowd closing down -0.6%, but made the day particularly dire as the currency INR was also weak. In Australia, news that CBA intended to break off some of its wealth management side hit its shares but also that of the sector. The weakness rumbled into the European session and saw subsequently saw all markets open lower. Yet again it was the DAX and auto’s that led Europe lower, but the rest were not too far behind. The US trade concerns continue to drag on sentiment and that in-turn hurt miners and industrials as fears grow of yet another slowdown on an economy that has extremely limited escape routes. In Turkey Mr Erdogan was successful in the Presidential race, although markets have not reacted that positively today. Bonds were out over 40 basis points as fears spread throughout. Italy was again weak with those spreads widening over 10bp to German Bunds. Across the core most indices were down around 2.25% for the day. Core German confidence was also a concern today following the IFO report. Core US industrials followed the weaker trend which finally resulted in a 328 point decline for the DOW. The NASDAQ was still the weakest finally giving back much of the recent outperformance. This uncertainty gave a bid to the VIX which rallied 26% today, closing a little over 17%. We did manage to bounce a little in the final 30 minutes of trading, but market-makers are not quite sure what to believe just yet and so were happy to wait for more confirmation. Japan 0.02%, US 2’s closed 2.53% (-1bp), 10’s closed 2.88% (-1bp), 30’s 3.03% (-1bp), Bunds 0.33% (u/c), France 0.71% (+1bp), Italy 2.79% (+11bp), Greece 4.07% (-1bp), Portugal 1.80% (u/c), Spain 1.34% (u/c), Turkey 16.11% (+43bp) and Gilts 1.30% (-2bp).